Hope Larson does an incredible adaptation of L'Engle's story in her graphic novel by the same name. Starting with the line, "It was a dark and stormy night..." the reader is instantly hooked. Hope Larson took what I pictured in my own head and brought it to life in these beautifully illustrated pages. I'll never forget being 12 years old and trying to explain dimensions to my little sister after reading A Wrinkle in Time. I took a piece of string and demonstrated the concept of a tesseract to my sister, showing her the shortest distance between two points with a 5th dimension. I really connected with the book. Now, even your struggling readers can connect with this story through the aid of visual representation. 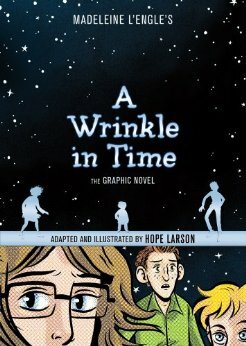 If you loved this story or even if you've never read it, I strongly recommend A Wrinkle in Time: The Graphic Novel by Hope Larson. You will not be disappointed! 14-year old Meg Murry and her 10-year-old brother Charles Wallace go on a search to find their father, a scientist who has been missing since his work with the tesseract project. Meg and Charles team up with Calvin (Meg's classmate) and the three Mrs. W's on their zaney adventure across the galaxy to fight darkness and save their father.